If your dreams of a Greek island holiday include glorious ocean views, a little lively nightlife and a lot of relaxing by the pool, make them come true with a stay at Jasmina. 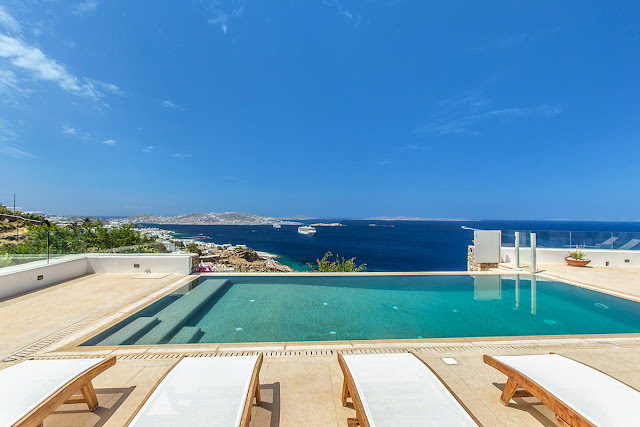 Set on a hill near Agia Sofia, this luxury Mykonos vacation rental looks out over the sea to neighboring islands and brilliant sunsets. 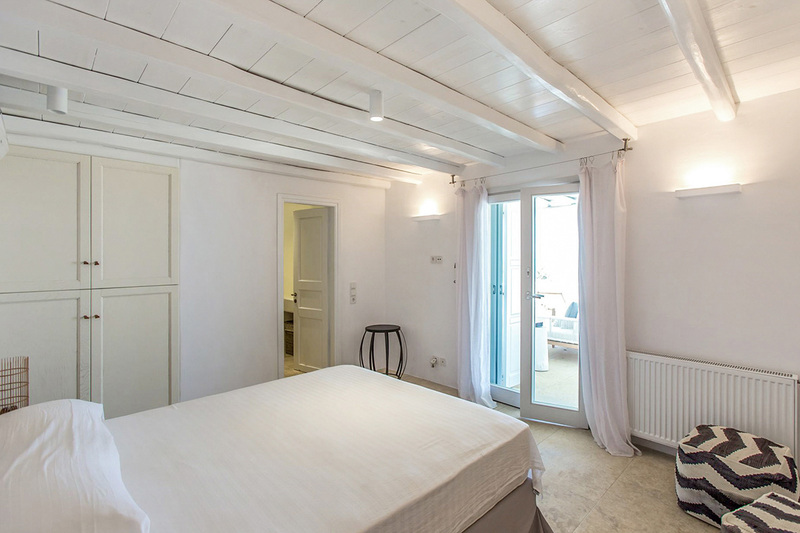 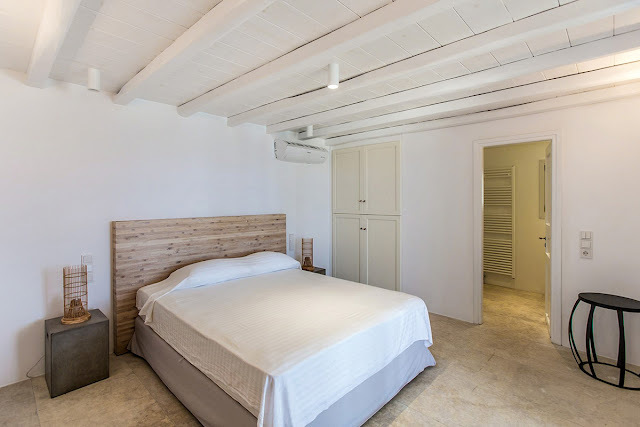 It’s quiet and private, but just minutes away from Mykonos town if you want to pop in for dinner or dancing, and newly renovated interiors and four suite-style bedrooms mean you can bring the whole family to soak in the Aegean sun. 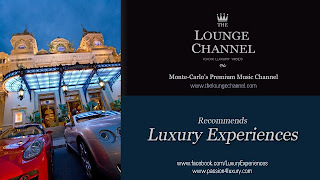 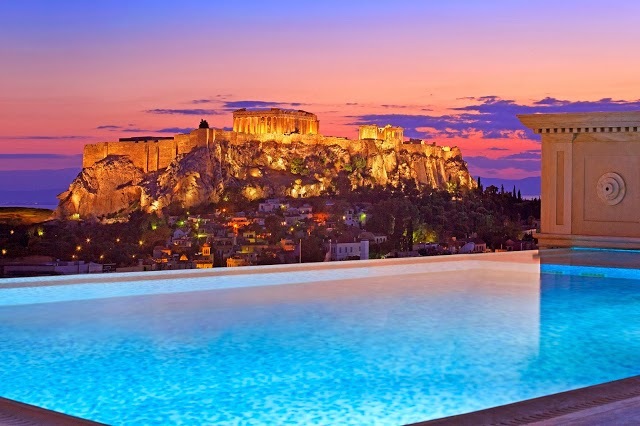 A large terrace partially covered by pergolas gives you a choice: sip a drink in the shaded sitting area or bask on a lounge chair next to the infinity pool, all while looking out at the water and feeling the sea breeze. An indoor-outdoor sound system lets you set the mood for entertaining or simply relaxing, and an al-fresco dining area lets you enjoy the terrace well into the evening. 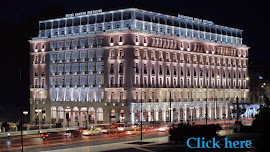 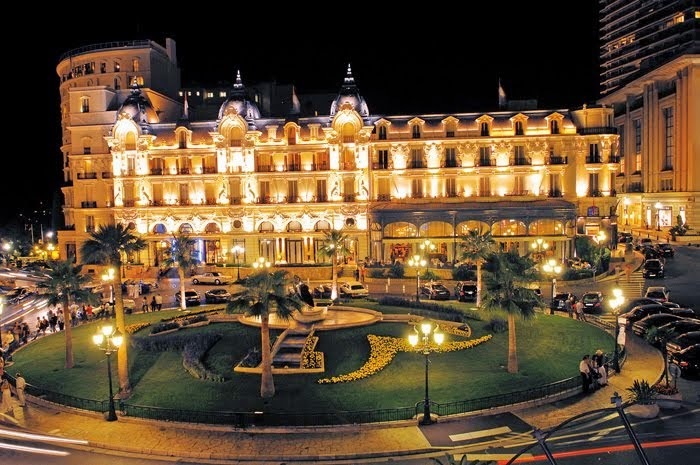 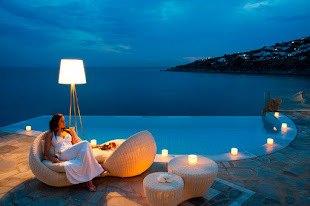 After the sun goes down, there’s also Wi-Fi and satellite TV to entertain. 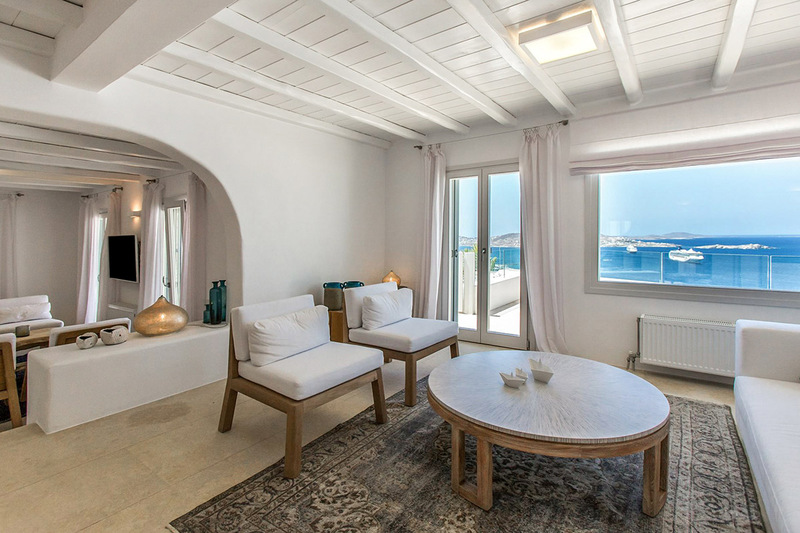 The interiors of Jasmina take inspiration from traditional Cycladic style, but the recent renovation added a fresh modern twist. 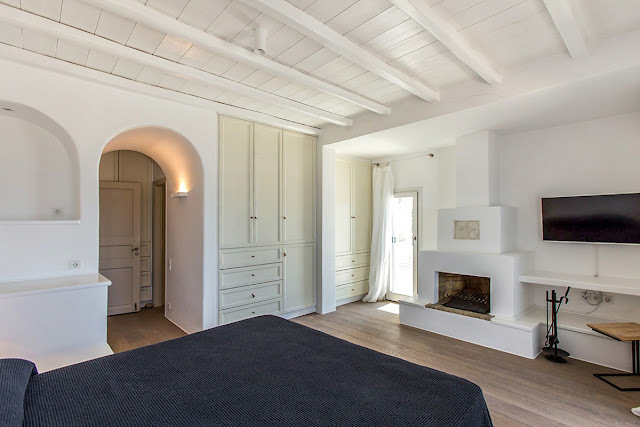 French doors, large windows and skylights flood the rooms with light, and stone walls and beamed ceilings wear a coat of white paint for a bit of natural texture with a crisp, clean look. 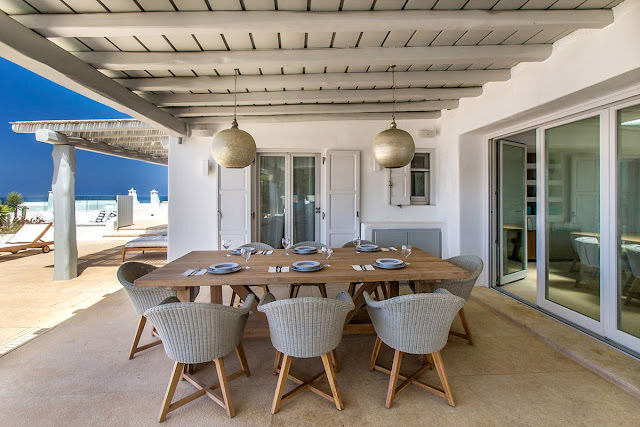 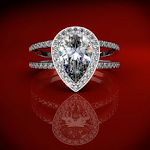 Furnishings are simple and stylish, from the armless chairs, white sofa and Persian rugs in the sitting areas to the cushioned, curved-back dining chairs. The fully equipped kitchen is equally sleek, with flat-fronted pale wood cabinetry and stainless steel appliances. Four bedrooms with en-suite bathrooms and air conditioning are ready to comfortably accommodate up to eight guests. 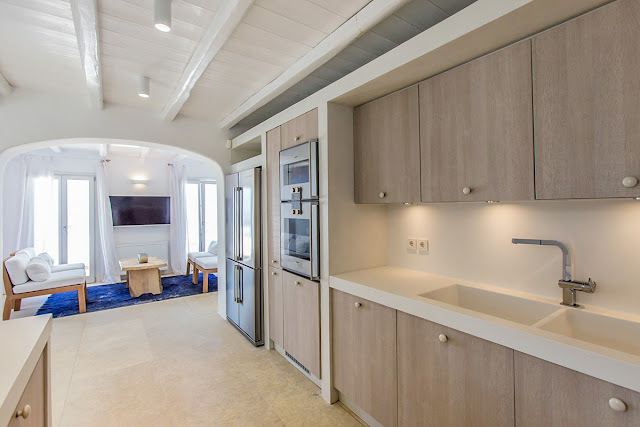 There are three bedrooms with double beds, two of which have balconies and ocean views, and one bedroom with a bunk bed that’s perfect for kids. 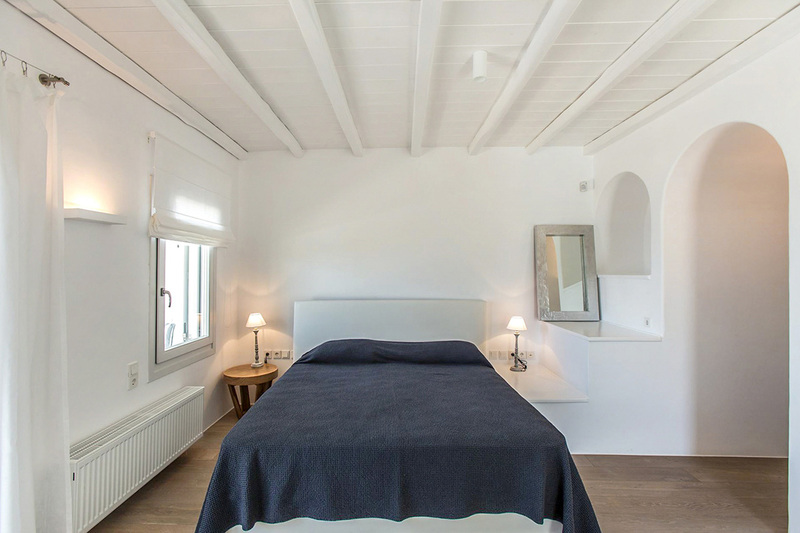 Charming features like built-in cupboards, display nooks and fireplaces lend quaint personality in the bedrooms, while all-white bathrooms are studies in beautiful simplicity. 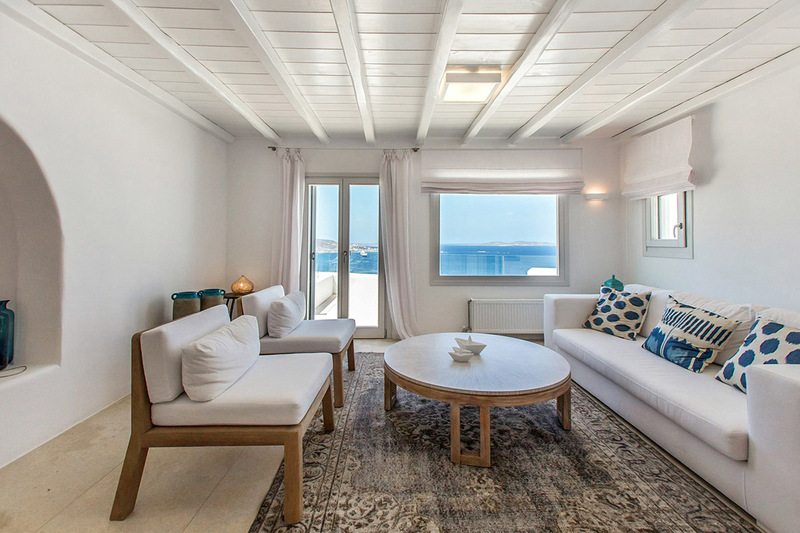 During your stay at Jasmina, you’ll have your pick of nearby beaches, from Agios Stefanos, 1.5 miles away, and Panormos, 3 miles away, to Agios Sostis, 3.5 miles away. 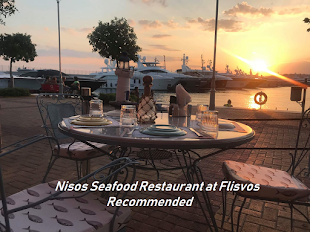 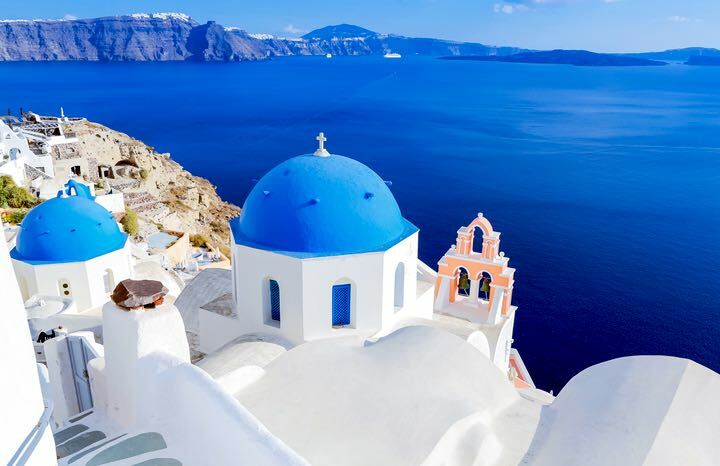 Feel like you’re on your honeymoon again with dinner at an oceanfront restaurant or relive your youth with a night out in Mykonos town, just under 2 miles away. 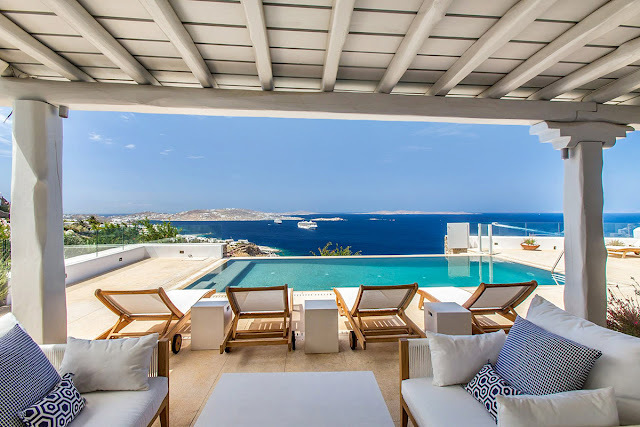 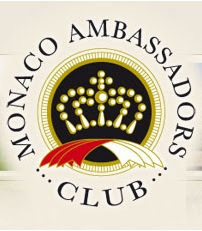 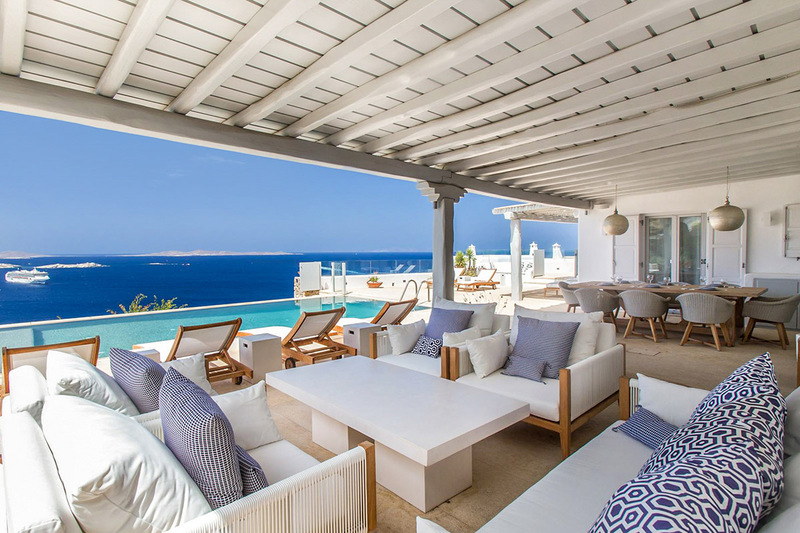 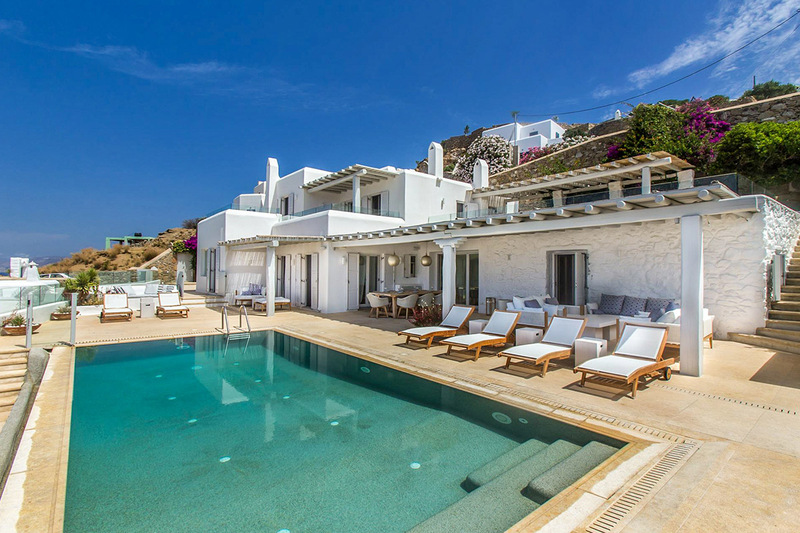 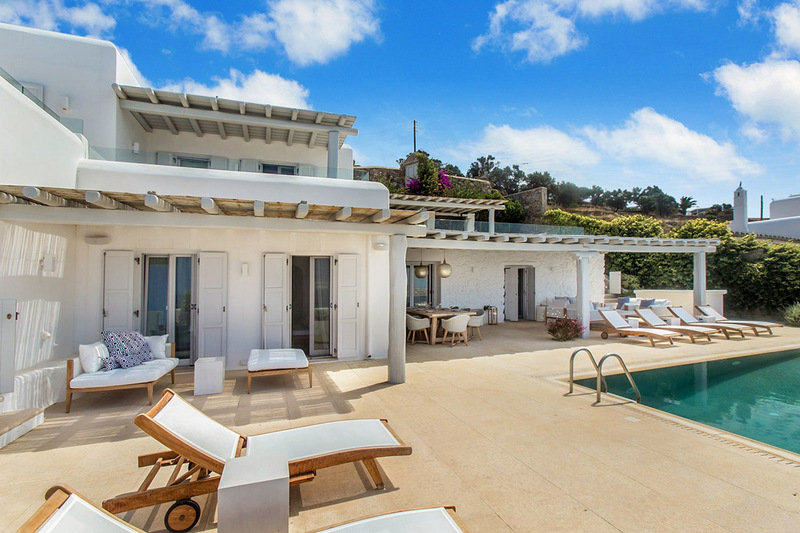 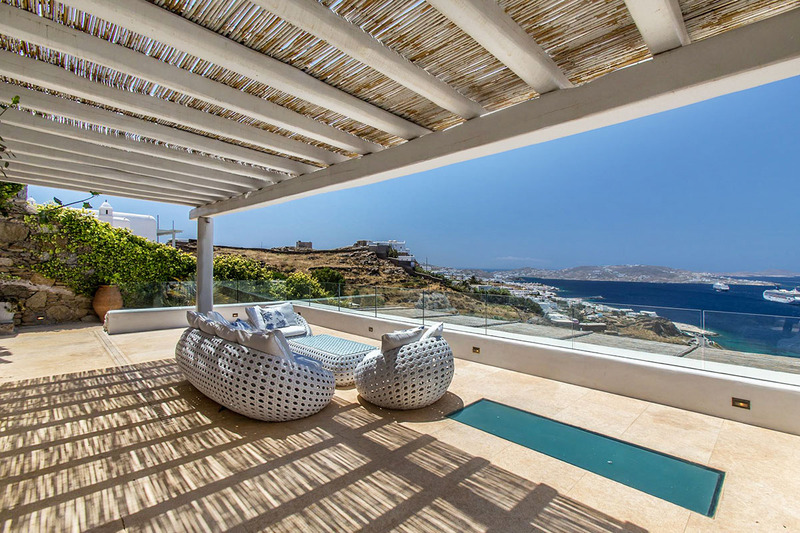 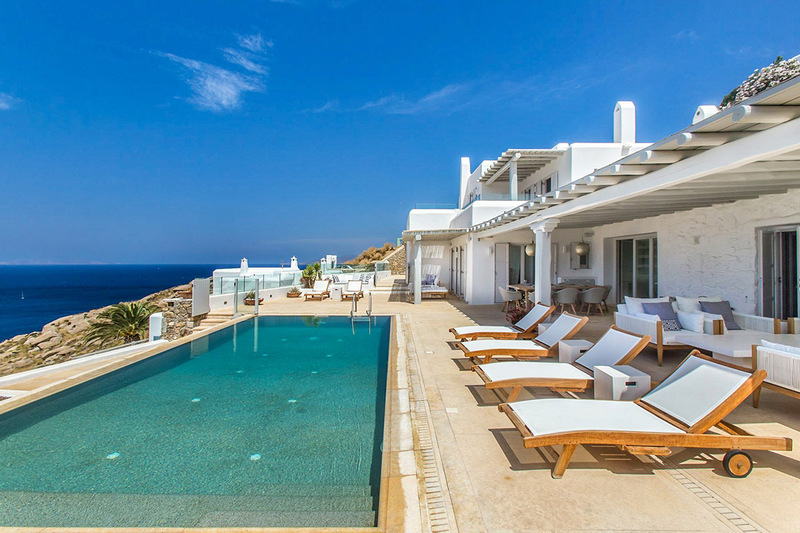 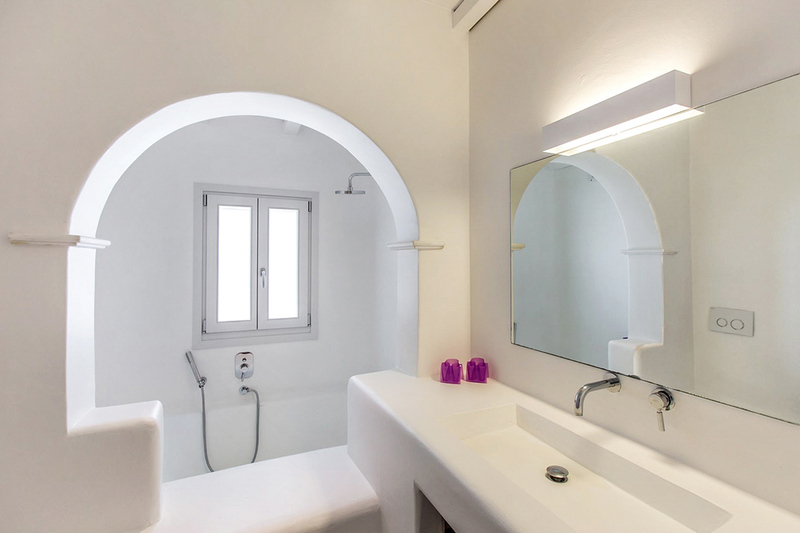 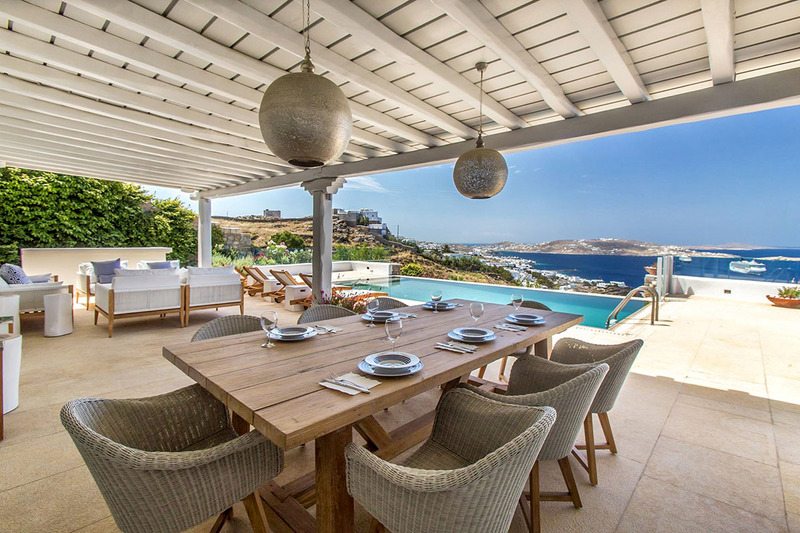 At the end of your trip, make your connection home via Mykonos Island National Airport, a 3-mile drive from the villa.